The relaxed, relatively peaceful atmosphere and viable tourism industry in Banda Aceh attests to the city's resilience in rebuilding after over 160,000 people were killed in the 2004 tsunami. Baiturrahman Grand Mosque has been added to your itinerary. Kick off your visit on the 30th (Sat): contemplate in the serene atmosphere at Baiturrahman Grand Mosque. To find other places to visit, reviews, more things to do, and tourist information, go to the Banda Aceh travel guide. Use the Route module to find suitable travel options from Kuala Lumpur, Malaysia to Banda Aceh. 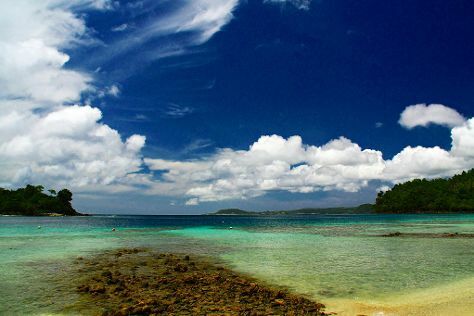 Finish your sightseeing early on the 30th (Sat) to allow enough time to travel to Pulau Weh. Thick jungle crowns Pulau Weh, a small volcanic island perched just off the northern tip of Sumatra. Kick off your visit on the 31st (Sun): pause for some photo ops at Monument 0 km Indonesia and then enjoy the sand and surf at Iboih Beach. To find traveler tips, ratings, reviews, and more tourist information, read our Pulau Weh travel guide. Explore your travel options from Banda Aceh to Pulau Weh with the Route module. Wrap up your sightseeing by early afternoon on the 31st (Sun) to allow time for travel to Banda Aceh. Your day-by-day itinerary now includes Pante Pirak Supermarket as well as Kapal Tsunami. On the 1st (Mon), enjoy the sand and surf at Lampuuk Beach, then see the interesting displays at Museum Tsunami Aceh, then don't miss a visit to Kapal Tsunami, and finally stop by Pante Pirak Supermarket. To find other places to visit, more things to do, and other tourist information, read our Banda Aceh travel guide. The Route module can help you plan travel from Pulau Weh to Banda Aceh. You will leave for home on the 2nd (Tue).